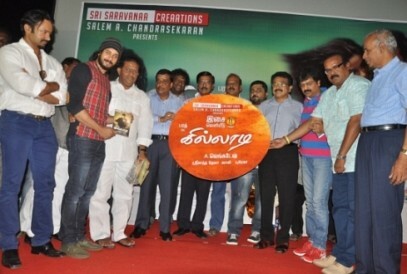 The audio launch of the Bharath starrer, Killadi, took place on Sunday morning at Prasad Labs, Chennai. The chief guests at the event besides the hero Bharath were producer Salem A. Chandrashekar who produced Ghajini with Suriya, actor-comedian Vivek, Vincent Asokan, Cell Murugan, Kaliaperumal, Saranya from Gemini Audio, Kalaipuli Sekar, Amma Creations Shiva, K.R, Gnanavel Raja, Pattukottai Prabhakar, Perarasu and a team of legal advisors. The film had supposedly overcome several legal hurdles with the assistance of the team of advocates that were invited as gesture of thanks. The other person responsible for the film’s smooth production was Kaliaperumal who was duly garlanded and was given a rousing welcome. Saranya from Gemini Audio said that they were pleased to be associated with Srikanth Deva after the recently released Machaan. Srikanth Deva himself said that composing for the film was fun and he had a jolly good time and announced that the film was fully of comedy. Several guests had words of praise for director A.Venkatesh saying that he works with great speed to cut costs for the producer and with the same vigor he moves on to his project. K.R said that A.Venkatesh was a talented commercial director who gives good films. K.R. took the liberty of requesting Gnanavel Raja to consider Salem Chandrashekar as the producer if he ever thinks about doing Ghajini-2 with Suriya. Vivek in his usual style made jokes about the large legal contingent on the stage but at the same time had a good word to say about A. Venkatesh, as he was instrumental in bringing Namitha to the limelight in Aei. Vievk also appreciated Venkatesh and said that he possessed the tact of knowing the audience’s pulse. The audio was released by Kaliaperumal and received by Gnanavel Raja. This page has information about The man who brought Namitha into limelight, Killadi, Bharath.